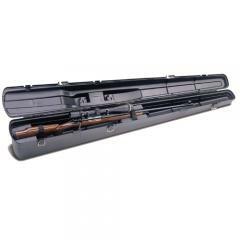 The Plano Model 1301 Protector AirGlide is a specialized carrying case designed for a rifle or shotgun with a scope. Its high-density foam interior and tie-down straps hold the weapon in place in such a way that it almost "floats" inside the case, leaving the scope untouched. This minimal contact between weapon and case removes the need to readjust the sights after every use, so you can be ready for action more quickly. The rugged hard-shell design features sturdy brass latches and hinges for security, as well as an oversized carry handle for convenient portability. Its locking tabs allow you to secure it against theft, and the design is airline approved to make air travel easier.